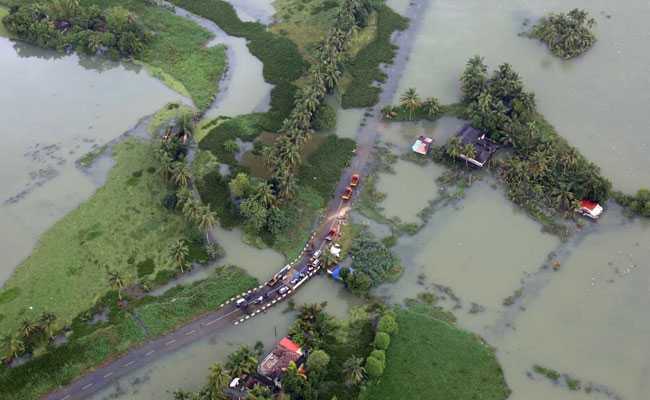 Kerala Floods: Kerala has seen over 250 per cent more rain than normal between August 8 and August 15. No outbreak of diseases has been reported in the state. Thiruvananthapuram: Rain has finally eased in Kerala hit by the worst floods in nearly a century that has killed more than 160 people since August 8. Over 300 people have died in the southern state this monsoon that has suffered damages over Rs 20,000 crore. Thousands of people are still feared stranded, awaiting relief and rescue. As the state and centre turn towards rebuilding efforts, the risk of disease outbreak in relief camps - where more than 6 lakh people have been given temporary shelter - has surfaced as a major concern. The intensity of rain has decreased in Kerala over the past two days, the weather office said on Sunday, adding that there is no alert of heavy downpour for the next four days. "Over the past three days, we have seen a gradual decrease in rainfall in the state," India Meteorological Department's Additional Director General Mritunjay Mohapatra said. Flood waters too began to recede in several affected parts. No outbreak of diseases has been reported in the state but the centre has set up around 3,700 medical camps across Kerala, the Health Ministry said in a statement on Sunday. "While no outbreak of any communicable disease has been reported, health experts opine that once floodwaters start to recede, the environment will become conducive for epidemic diseases. The state has been asked for daily surveillance to detect early warning signs of any outbreak," a Ministry statement said. Three people with chickenpox in one of the relief camps in Aluva town, nearly 250 km from state capital Thiruvananthapuram, have been isolated as a precaution, Anil Vasudevan, who handles disaster management at the Kerala health department, said. The authorities are cautious about disease outbreak. Rescue operations were focused on the town of Chengannur on the banks of the Pamba River, where some 5,000 people are feared to be trapped, officials told news agency Reuters. Air India said on Sunday it will operate commercial flights from the naval airport in Kochi to Bengaluru and Coimbatore, starting Monday. The airstrip was cleared to operate passenger planes on Saturday. There was no shortage of food in the state as traders had stocked up ahead of a local festival, Kerala Chief Minister Pinarayi Vijayan had said on Saturday. "The only problem is transporting it," he told reporters. "The central government and public have cooperated well in this effort to fight this disaster." The state government on Sunday informed the National Crisis Management Committee that the situation in the state was gradually improving.